Filed to: Biff! Boff! Kapow!Filed to: Biff! Boff! Kapow! 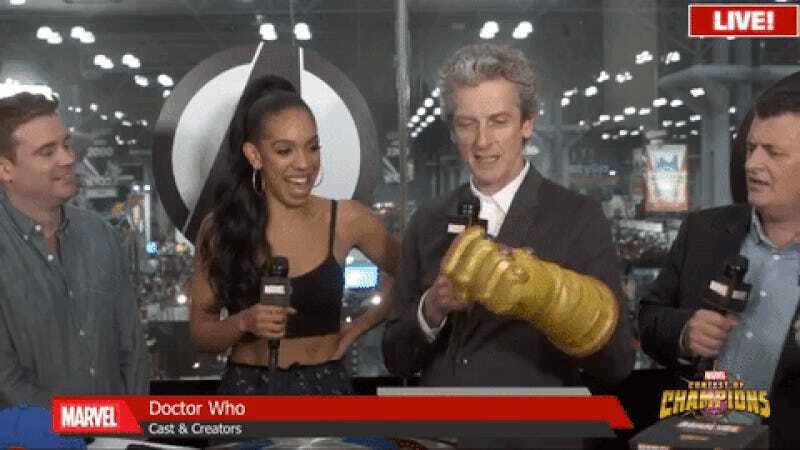 Peter Capaldi and company paid the Marvel NYCC livestream a visit at the con last week, so naturally the Doctor managed to get his hands (well, one hand, technically) on the most powerful item in the Marvel cosmos. To be fair, his reign of violence was mostly punctuated by light bopping instead of mass slaughter, which puts him one up on Thanos. At any rate, check out the Who appearance from Marvel’s NYCC livestream in full below.